Need new apps for your favorite device? 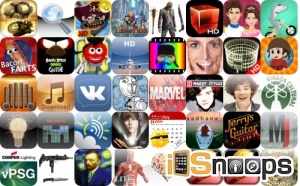 Here are 46 iPhone, iPad and iPod touch apps that just hit the App Store. This new apps alert includes Bowling Game 3D, Tank-O-Box, Invader Zurp, Make Soda, Explodorum, Tap to Unlock, Slumber Shark, Dress Up, Glass Tower 2, Kill Zombies, Oldies Radio+, and many others. Pirate Walk HD – WARNING: Insanely Addictive!